It was also being watched. On a distant hill there stood a girl with binoculars. The lenses were focused on the small machine as it rolled through the grass. After a while the girl lowered the binoculars and closed her eyes, tilting her head slightly as if she were listening to something. Her unkempt black hair blew across her face, but she paid it no mind. She was so still that anyone watching might have thought her asleep. The girl wore cargo pants that whipped against her legs as the wind ran past and a functional black tank top that revealed well-muscled arms. A piece of cloth was wrapped around her head in a hopelessly optimistic attempt to keep her thick hair under control. The girl was so much a part of this desolate place that her presence did not carry with it a hint of violation or intrusion. Instead, as she stood there with her eyes closed, she seemed at once a natural and indeed integral part of landscape. Finally, the girl opened her eyes. It seemed she had come to a decision and in one easy movement she climbed into the back of the vehicle sitting on the hill next to her. This dearly loved, but battered old vehicle could not be described as much more than a long rusted tub. Two little wheels at the back and a single heavy track visible under the vehicle’s snub nose provided mobility. Instead of a steering wheel, the tread underneath was directed by a pair of handle bars. The girl took hold of these and maneuvered the vehicle over the edge of the hill. She braced her feet and leaned back as she descended, bending slightly at the knees to keep from toppling out the front of the vehicle or jolting over the sides. Still inside the vehicle at the bottom the hill, the girl drove off in the direction she’d seen the robot. It didn’t take long for her to find the trundling machine and she drove a little way past it before climbing out of the tub. An airship had crashed here long ago and although nature had reclaimed most of the wreckage, a single wing was still visible, rising from the grass like the fin of a shark, broken and rusted. This would not have been of any interest except that the wing was in the path of the approaching robot. The girl watched as the little machine rolled into the wing, bumping against it. The tire reversed and the robot tried again, obstinately bumping its way along the wing until it found a way around, whereupon the little machine corrected its course in an affronted manner and rolled away. The girl leaned back inside the tub and lifted a sleek heat rifle from the wooden floor. The rifle’s smooth plastic body glinted menacingly in the harsh light, more a precaution than a safety measure, as the little machine didn’t seem dangerous. The robot did not change course as the girl approached, but continued forward steadily. 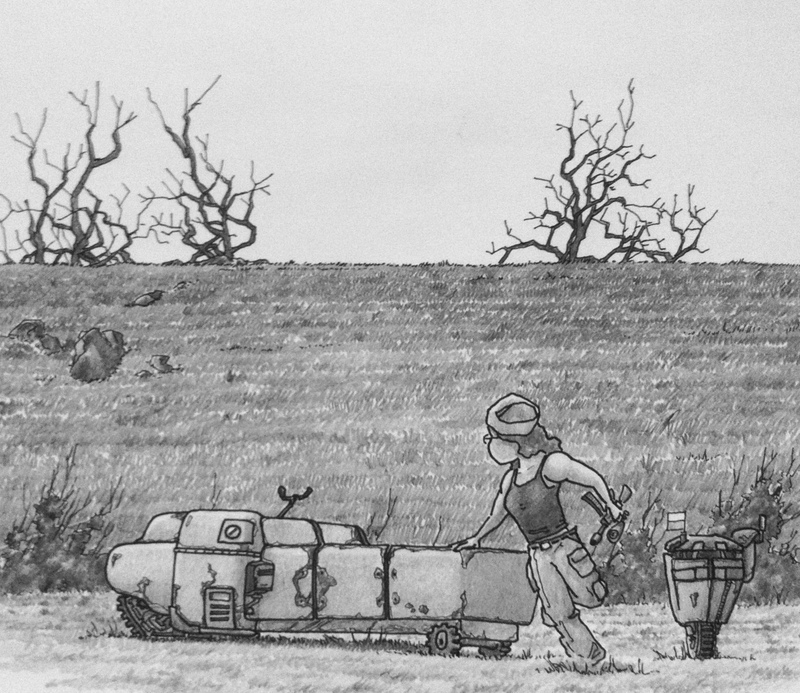 The girl stopped in its path and the robot bumped heavily against her leg, the tire digging deep into the dirt trying to get past this new obstacle. The girl stepped aside, but grabbed hold of the machine as it tried to pass, crouching down next to it and running her hands over the worn metal. She touched the flag and had to quickly adjust her balance to keep from getting pulled over as the machine tried to lurch away. As she examined the robot she noticed there were three buttons set into a panel just behind the flag. She was about to press one of them when suddenly her expression changed and she whipped her head around. A flock of birds had risen from the branches of a grove of leafless trees that stood on a distant hill. The girl watched as one by one the birds started to fall from the sky, their bodies disappearing into the tall grass, only one or two escaping. All the blood drained from the girl’s face as she watched. She desperately tried to control the panic rising in her throat. The robot, finding itself suddenly freed, rolled away as if nothing had happened. The girl closed her eyes, screwing them shut as tightly as she could manage and rose, making her way quickly back to the tub and crouching behind it. Her whole body was still, nearly shaking with tension. She sat there frozen, for a moment, before suddenly taking a ragged gasp of air and spinning around in one mighty rush of panic and bravery. She leveled the rifle barrel towards the hill where the birds had fallen. Her eyes were still tightly closed. The girl was perfectly still. Nothing moved except for the flowing patterns of grass all around her. The girl forced herself to take a single controlled breath. She breathed in slowly, her chest expanding and contracting as she let the air out through her nose. Still nothing moved. She took another breath, slowly in, slowly out. Maybe she had been mistaken. Maybe it was something else. Then the breath caught in her throat. Something had appeared over the top of the hill. It looked like stone, a dark brown or grey, covered in what appeared to be white lichen and roughly triangular in shape. It rose above the hill, rocking slowly back and forth as it moved. The girl tightened her finger on the trigger of her rifle, releasing a single shot. A concussion of superheated air expanded away from the barrel and the upper portion of the thing coming over the hill exploded, raining chunks of grey and white over the hillside. Wind blew across the grass, but nothing else moved. The girl was shaking now and the rifle slipped from her hands, falling into the bed of the tub. The girl sank down slowly, turning so her back was against the rough panels of the vehicle’s side. She held the back of her head, fingers tangled in her hair, and drew her knees up to her chest trying to control her shaking. Her breath was coming in ragged gasps as she waited for the fear to subside. After a long while her breathing slowed and the shaking stopped. Unsteadily, she got to her feet and climbed back into the tub, steering it away from the distant hill where the indistinct form of the thing lay motionless in the grass, surrounded by dead birds. Throughout all this, the girl had never opened her eyes once. And it was not until she was a good distance away, that she opened them again.